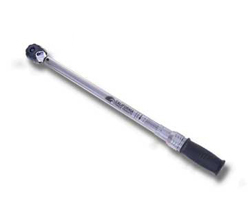 The 2503CTPRH torque wrench is an industrial grade micrometer click type wrench designed for years of service. The wrench is equipped with a 1/2" dual direction quick release, 32 tooth ratchet. It has a precision laser marked scale that has a range of 30-250 Ft-Lbs with adjustment increments of 1 Ft-Lb, with a quick easy to use adjustment lock. The wrench is equipped with an over molded durable chemical resistant and ergonomic comfort grip rubber handle. It has a highly polished durable bright chrome finish. The wrench is fully repairable and easily calibrated. It is calibrated to +/-3% at any setting, meets ASME B107.14B specifications, and includes a 1 year warranty. 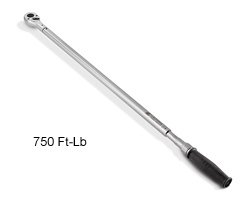 The 6004CTPRH torque wrench is an industrial grade micrometer click type wrench, designed for years of service. The wrench is equipped with a 3/4" dual direction quick release, 24 tooth ratchet. 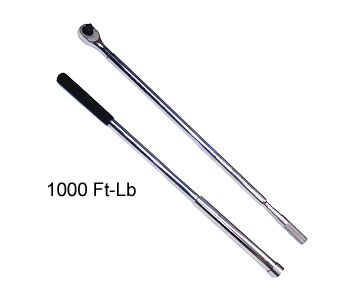 It has a precision laser marked scale that has a range of 100-600 Ft-Lbs with adjustment increments of 5 Ft-Lbs, with a quick easy to use handle. The wrench is equipped with an over molded durable chemical resistant and ergonomic comfort grip rubber handle. It has a highly polished durable bright chrome finish. The wrench is fully repairable and easily calibrated. It is calibrated to +/-3% at all setting, meets ASME B107.14B specifications, and includes a 1 year warranty.